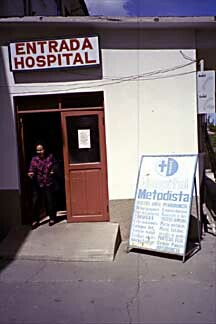 Hospital Metodista front entrance, October 2000. 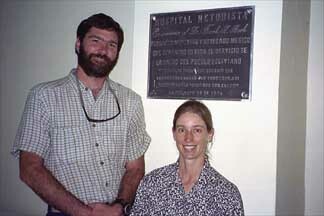 In l939, Dr. Frank and Bessie Beck established Hospital Metodista in Obrajes, just on the outskirts of La Paz, Bolivia. 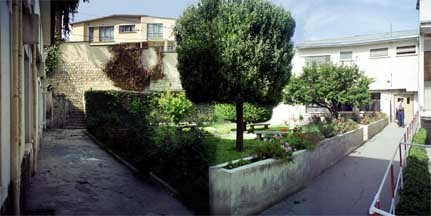 Bessie states, "We were not able to secure additional land so that we could have an outlet for the hospital, which would be independent of the school (Instituto Americano), as patients came day and night and it was not convenient for the school to have them going through their grounds. So we decided to move to Obrajes, 1000 feet below the city, in a beautiful suburb of the city. Land was purchased from an ex-president of Bolivia, Dr. Luis Tejada-Sorzana, and plans were made for the change to this new site. Mr. Irle, who was the general architect for the construction of new mission buildings, came from Chile to draw up the plans and start the work." 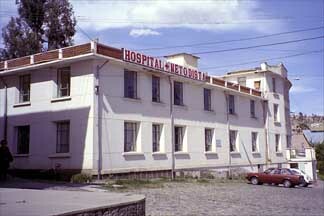 When the hospital was completed it was the most modern in Bolivia, capable of handling 80 patients. 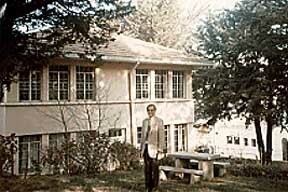 Beck's particular pride was the home and school for 30 nurses. 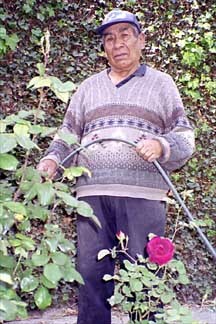 When he had arrived in Bolivia, nursing as a profession was virtually unknown. Young women with education sufficient to qualify for training (mostly Spanish, from wealthy families) scorned nursing as servant work. To get the necessary technical personnel, Beck brought in underprivileged girls, imbued them with the idea that here was a chance at a professional life not otherwise open to them, then rigidly drilled them in the arts of healing. School of Nursing (left) An important part of the medical work was the establishing of the Training School for nurses. 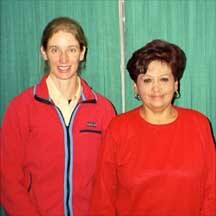 Dr. Beck's daughter, Miriam, who had completed her Nurses training and her B.S. 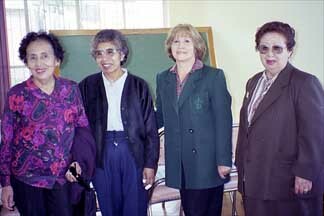 degree in the States, returned to Bolivia in 1939 to start the regular three year training course for nurses. By 1955 the nursing school of Clinica Americana had turned out 103 graduates. In 1960 hospitals, health centers and clinics throughout Latin America clamor for nurses trained there. At one time the public-health section of Servicio Cooperativo Interamericano, U.S. foreign-aid agency, had 34 Beck trained nurses on its staff, declared them "the best in the world." 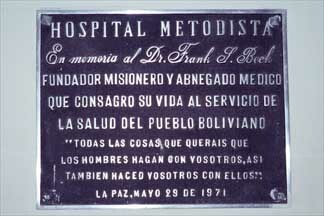 Dr. Beck is gratified by such accolades, but even more by the fact that the Bolivian government is closely copying his nurse-training program in its public health service. He says: "The biggest contribution that medical missions can make is to stimulate others to do for themselves." Bessie states in a letter: "During the 1944 revolution, a cocky young soldier burst into the clinic. "It is believed you have fugitives here," he boomed. "I search!" Amused, Beck led him gravely through the wards, only slightly discomforted by the sub-machine gun the boy carelessly waved in his face. Beck was about to open the last door when the soldier lowered his gun, accidentally tripped the trigger, and blew off half of his own toe. Enraged that anyone would so carelessly endanger his patients, Beck escorted the soldier to surgery and took off the rest of his toe-without benefit of anesthetic. Room 206 - Bullet holes in floor from 1952 Revolution.When the Siles government came to power in 1952, sweeping land reforms were initiated. Indians, for the first time in 400 years, now own their own land, are able to negotiate wages. In June of 1956 they were given the right to vote, something hitherto unknown in Bolivia's long history." 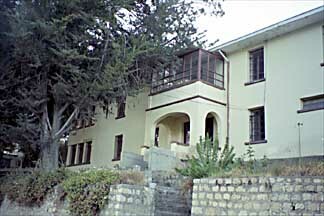 Apartment that Nelson lived in from 1927 to 1939, until he traveled to the States to attend college. 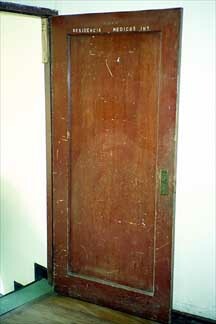 Entrance door to 3rd floor. "From the first he insisted on living in a small apartment on the clinic's top floor where he could hear every night sound, tell by a nurse's step down the corridor whether he was needed. "When you're trying to do a job," he said, you have got to be on the job." Told he would kill himself by overwork, he snorted: "Work doesn't kill a man; worry does." Bed patients soon learned to detect his short, quick step in the corridors, were comforted by his habit of softly singing hymns, humming or whistling as he performed operations. One, asked if her emergency appendectomy was an ordeal, replied, "How could it be? The senòr doctor's voice was more soothing than the anesthetic." Sylvia Cohn (foster child of Dr Frank and Bessie Beck) gave us the name of her good friend Beatrice Fiorilo from Obrajes. Beatrice's mother was a top surgical nurse with Doc in Obrajes and her grandfather was Nestor Perenanda. Nestor was the Methodist pastor who would translate Amaryan to Spanish for Doc when they would visit the Altiplano on my grandfather's motorcycle. As young girls they would lie on their stomachs on the roof of the hospital looking down through the skylights into the operating rooms to watch the surgeries. 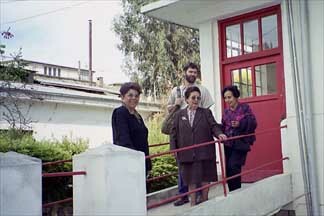 Beatrice, Sylvia and Perlina traveled to the States with Dr. and Mrs. Beck in the late 1960's to attend high school and college. They first attended Canton High School in South Dakota and then they all moved to Tyler, Texas. When the girls were enrolled in nursing school, Nanny and Doc moved to Southern California near their daughter Miriam. Sylvia, Beatrice and Perlina joined them in California years later. We met Mina Leyton (middle), Martha Loetz (right) and the director of the hospital, Eunice Zambrana (left). Mina is Ruth Fuentes' sister. 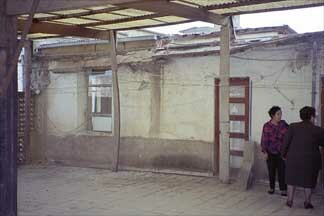 Ruth's and Mina's father was a carpenter during the construction of the hospital. My dad was friends with their father and would go over to their house after working on the construction of the hospital. Ruth and Mina are about 5-7 years younger than dad. The five of us walked though the entire hospital from the kitchen on the bottom floor, meeting the cook and his wife (that only speak Amaryan) to the top floor where dad and the rest of the family lived. I gave Eunice a small photo album including pictures of Nanny and Doc to share with the staff. A picture is worth a thousand words, especially when we don't speak fluent Spanish. Eunice spoke about how the Hospital was mismanaged for so many years that the debt they owe to the bank is too great to continue operating as a hospital. About 10 years ago a University leased part of the Hospital, but failed to pay the utility bills and rent, putting the hospital in greater debt. Eunice came out of retirement, as a nurse who was trained by Doc, to help shine up the hospital while it is on the market for $5 million US dollars. Currently they are leasing part of the building to a burn unit and physical therapy center. Eunice is organizing tea parties, bake sales, rummage sales and volunteer workers to help raise money to purchase paint, beds and linens to give the hospital a fresh new look. After the tour we had tea and cakes with about 12 nurses who were trained by Doc. 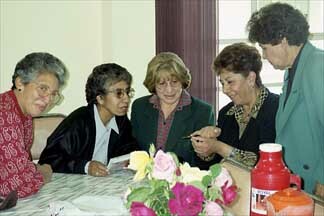 Martha Loetz (left) and Mina Leyton (right) with nurses that were trained in Hospital Metodista. Eunice Zambrana is showing the nurses a small flowerthat was blooming on the leaf of the plant.